We’d love your help. Let us know what’s wrong with this preview of Tinsel by Hank Stuever. 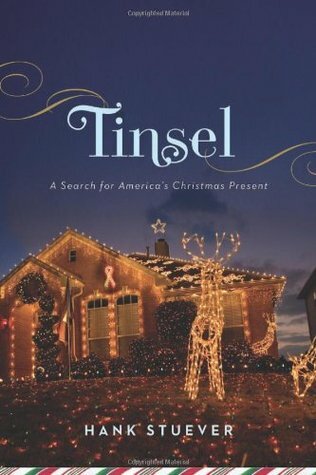 In Tinsel, Hank Stuever turns his unerring eye for the idiosyncrasies of modern life to Frisco, Texas—a suburb at once all-American and completely itself—to tell the story of the nationâ€™s most over-the-top celebration: Christmas. Stueverâ€™s tale begins on the blissful easy-credit dawn of Black Friday, as he jostles for bargains among the crowds at the big-box stores. From there he follows Friscoâ€™s true believers as they navigate through three years of holiday drama. Tammie Parnell is the proprietor of “Two Elves with a Twist,â€ a company that decks the halls of other peopleâ€™s McMansions. Jeff and Bridgette Trykoski spend eleven months preparing the visible-from-space, awe-inspiring light display they stage on their lawn each December. And single mother Caroll Cavazos, a devout churchgoer, hopes that the life-affirming moments of the season can transcend her everyday struggles. 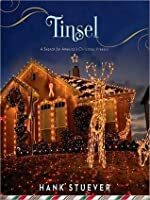 Tinsel is a humane, revealing, and very funny portrait of one communityâ€™s quest to discover a more perfect holiday amidst the frenzied, mega-churchy, shoparific world of Christmas. Christmas is one of those polarizing things, like the Kardashians and pumpkin spice, that people are either obsessed with or can't stand. There. Is. Literally. No. In-between. With this in mind, in 2006, Hank Stuever decided to go to Frisco, Texas to observe the locals for several months as the holiday season rapidly approached, and recorded everything that he observed while also primarily following 3-4 different families who would tell you that they f*cking loved Christmas if it wouldn't get them a mouthful of juniper-scented soap from Bath and Body Works, first. Frisco is interesting because it's a region of the country that probably considers itself folksy and down-to-earth, and yet, the burgeoning middle-class is filled with conspicuous consumers who want all the latest in tech (even if said tech is produced by us liberals they hate so much) even as they go to craft fairs for fruit-strewn wreaths and come up with alternative facts about candy canes, such as the fact that they are actually "J"s for "Jesus." I saw a few people, who are obviously conservative and obviously took issue with some of the author's snide observations, rating this book negatively because they took issue with the politics of the book. That's fair, I guess. The author is liberal - and I think he said that he was also gay. So obviously, going to Texas is going to be an odd experience for him, for a multitude of reasons. Keep in mind, this was in the middle of the Bush administration/Iraq War, and pre-gay marriage legalization, so politics definitely was a huge thing on many people's minds, and it would be inaccurate reporting to omit how this shapes Texans' ethics/lifestyle. The three main families in this book are Tammie, a professional Christmas decorator; Jeff and Bridgette, people who go full-out Clark Griswold with their lights; and Caroll, devout worshipper at an actual megachurch who worries about being a good christian and taking care of her fam. Does the author sneer a little at these humble people he's writing about? Yes, a little. But I don't think he was cruel. And honestly, some of the things in this book are so ridiculous that it's hard not to roll your eyes. As someone who is neither conservative nor religious, it was so interesting to see this snapshot in time from the "other" perspective. You have people who are so like you in some ways, and yet so unlike you in others - and for some reason, it's the ways that they aren't like you that end up seeming so much bigger and more important, because those drive the choices that make them so annoying. Part of what I loved about TINSEL is that the author did such a good job showing both the good and the bad parts of what it means to be an upper-middle-class Texan at Christmas. It was obvious by the end of the book how much he had grown to care about the participants in these little microhistories, and how much they had grown to care for him as well. Reading about all these familiar parts of my own teenage years - Converse, Natasha Bedingfield, Icing by Claire's - interspersed with emotionally manipulative radio shows peddling tragedy to sell Jesus and women who consider Sarah Palin their honorary BFF and would sell their soul to decorate Barbara Bush's house... well, it's surreal. This was available on Overdrive’s Happy Holidays collection. I grabbed it on a whim. I'm glad I did. 4.5 stars and an excellent narrator. In 2006, Stuever decided he was going to find the magic of Christmas by doing some research in Texas where everything is bigger and God is holier and lights are brighter and shopping is an honest-to-goodness pasttime. He meets some interesting people - like the Trykoskis whose light display is famous across the country. Theirs was the only story to which I could relate. There's also Tammie the professional Christmas decorator who is fairly shallow and unlikeable yet it's hard not to like her anyway, and Carol, a single mom whose youngest is her BFF and who wants to make sure her kids get the best Christmas every year while also making sure her church's holiday production goes off without a hitch, and all the other things she deals with, too - and spends six+ weeks, from Black Friday (of which the description gave me hives) to just after the new year with his selected families to see how they find and express their belief in Christmas. He wants to do this to prove/disprove his theory that we don’t actually remember Christmases past, that we’ve cobbled together memories based on TV and movies, that Christmas has only been a commercial endeavor for the past 150 years and we have to disassociate with that knowledge by creating a story centered on believing in Christmas magic. Then the story of a drowned cat at Christmas follows and it’s horrible. This book made me cringe often because I hate the whole Christmas shopping thing and the author makes it obvious how markety it all is, how we’re like cattle stampeding through malls and decorations from late October to the end of December. It's pretty bleak. I was glad no one could see my face as I listened to the MegaChurch part. It was disconcerting. Also, Pastors Keith and Sheila named their first daughter Keila. How is that even legal? Is that where Stephenie Meyer got the idea for Renesmee’s name? It’s not as amazing and adorable as you think, people. Stop it. Stop doing that to your babies. Also: OHMYGOD! The radio show wish thingy with the boy who wrote in about his sick and abused mom? This is the new traveling vaudeville. The melodrama! The snake oil! It makes me want to be horrible and manipulate people to do what I want them to do, namely, give me money. I love the traditions surrounding the winter holidays but I don’t love the money part so this hit close to home: For those who opt in, Christmas is supposed to exist as a pure moment of bliss and togetherness. We spend more money than we have at Christmas, in part to get closer to the simple joy it advertises. Many millions of people find an inspiration in Christmas every year, unpacking it just where they stored it last year and basking in its returning glow. The years go by, babies are born, and it’s supposed to get better each time...except...but...however. Because it looms so strong in memory and because the happiness it represents can be so achingly elusive, Christmas can bring us down like almost nothing else. It is our happiest day and our greatest disappointment all in one, heavily freighted with expectation and then the loss of innocence. Cynical and harsh...and it’s so sad. That doesn’t make it wrong or untrue, though. So did he find Christmas magic? Tammie (Mary), Jeff (Wise Man), Bridget (Angel w/ cracked wing), Carol (Shepherd) found magic and that was the magic for him, seeing others find it, even if he never saw it himself. Interestingly enough, he doesn’t believe in Christmas and magic and tra la la but he returns to TX after he’s done with his story. He goes back for another Christmas. Why? All throughout my notes, I mention how depressing this story is, how bleak, yet I really liked it though I don’t even know why. It’s lonely and awful. But it's also an excellent look at a few families in Texas showing an outsider what Christmas means to them. Koivu! There’s a Wodehouse passage about Christmas being at our throats as a chapter introduction! I thought of you. What do you think would happen if a liberal D.C.-based journalist decided to chronicle Christmas as celebrated by a group of Texans? If you think this sounds like it would result in some hilarious observations, you've got the basic idea of Tinsel. Hank Stuever gets his liberal views in, subtly and not-so (one angst-filled monologue wonders about the choices of Americans: Why Crocs? ... Why Carrie Underwood? Why George Bush? (Why Hillary Clinton?). (Gotta love the oh-darn-if-I-mention-Bush-I-must- What do you think would happen if a liberal D.C.-based journalist decided to chronicle Christmas as celebrated by a group of Texans? If you think this sounds like it would result in some hilarious observations, you've got the basic idea of Tinsel. But I digress. Stuever tells us he doesn't believe in the virgin birth, and lets us know he's in good company: Many scholars have concluded ... that the Christmas story is intentionally fictive, written by the earliest, first-century evangelists to beef up Jesus's street cred as a believable Jewish Messiah. O-kay then. I can tell up-front that the author and I are coming at this from different belief systems. Nonetheless, it's enjoyable in a gossipy sort of way to read his tales of following those wacky over-the-top Texans to their ridiculous mega-churches, to camp out early on Black Friday, and to their business decorating homes for Christmas. I know this happens a lot for me, but the author's liberal bias really became tiresome. He subtly chastises his subjects over and over for being anti-immigrant, "tax-averse, conservative, ... evangelical." Yet when he listens to a Christian radio station that grants "Christmas wishes" for needy folks, he is angry that no one is asking questions about whether the "needy" truly are so. Why is it good when he asks questions, yet bad when those evil/stupid conservatives do? You know I had to love a passage where he discusses telling kids that Santa isn't real. He says that he could actually respect kids who thought it through and realized that Santa was fake, because they would grow up to think critically and perhaps - get ready for it - not believe that "other countries harbor weapons of mass destruction when they don't." Yep - apparently even Christmas excess is W's fault. One thought that kept running through my head as I read this book was that I couldn't believe these people would allow an author to follow them through three Christmas seasons, just so he could write a book basically making fun of them. He even uses most of their real names. I'm still stumped at this. The book ends with Stuever taking a swipe at Sarah Palin (but oddly enough not mentioning Obama, whose recent election has heralded inherited an economic meltdown of catastrophic proportions) as he flees Texas, of course appropriately via the George W Bush Turnpike, back to his East Coast boyfriend. I'd like to give this 3.5 stars, but I just don't have it in me to bump it up to 4. Not that the book was bad; quite the contrary, actually. Stuever is an entertaining, if slightly hipster and derivative, writer, and the book was fairly enjoyable (thus the 3.5 stars). But it was...unsurprising. Were there any great insights we were supposed to gain as we read about three Frisco, TX, families and their observation of the Christmas season? With one single exception - a 30-something husband who cov I'd like to give this 3.5 stars, but I just don't have it in me to bump it up to 4. Not that the book was bad; quite the contrary, actually. Stuever is an entertaining, if slightly hipster and derivative, writer, and the book was fairly enjoyable (thus the 3.5 stars). But it was...unsurprising. Were there any great insights we were supposed to gain as we read about three Frisco, TX, families and their observation of the Christmas season? With one single exception - a 30-something husband who covers his house with lights to bring joy to people who pass by - none seemed to really know what Christmas is. Is it in the decorations? The shopping? The overloading of children with obscene amounts of gifts in the desperate search of "the moment"? I have no idea. Neither, I think, does Stuever. Or his subjects, for that matter. Being a nonfiction nerd, I thought perhaps this one might be interesting, so got the audio from the library, with the possibility that I might have to abandon it: indeed not! In a nutshell: D. C. journalist Hank Stuever "embeds" himself with three Frisco, TX (Dallas suburb) families for the 2006 Christmas season, last one before the Big Mortgage Crash, where that area was hard hit by foreclosures. The stories follow Tammy, a professional Christmas home decorator, and her family (author works as h Being a nonfiction nerd, I thought perhaps this one might be interesting, so got the audio from the library, with the possibility that I might have to abandon it: indeed not! In a nutshell: D. C. journalist Hank Stuever "embeds" himself with three Frisco, TX (Dallas suburb) families for the 2006 Christmas season, last one before the Big Mortgage Crash, where that area was hard hit by foreclosures. The stories follow Tammy, a professional Christmas home decorator, and her family (author works as her "elf" or assistant/intern), single mom Carol and her three kids with whom he attends church and socializes, and a childless, secular couple (Jeff and Bridget), known for having one of the largest, most involved holiday displays in the nation. Interspersed are details of local history and culture, which are done well to help keep the story moving. Stuever does an excellent job of respecting his subjects as people, while remaining skeptical, shall we say, of the excess in which they revel. I found his being openly gay almost completely avoided, and would have liked to have heard more about how they dealt with the issue, but he probably felt that was injecting himself into the story; Tammy's treating him at times as an "honorary girlfriend" I found slightly cringeworthy towards the end, but nowhere near a deal breaker. I suspect his having been raised in Oklahoma, rather than the northeast, may have worked in making Carol and Tammy's families feel more comfortable around him. Speaking of his being a guy with great social skills, after purchasing gifts for four "Angel tree" recipients, he gets the local social services director to give a behind-the-scenes look at the program's administration, as well as following up after December 25 regarding the effect of holiday excess on local recycling and garbage services. Overall, I found the book fascinating, except perhaps for the parts dealing with holiday lighting, which did go a bit deep in the weeds (Asperger-level from those involved, not the author), but even that helped focus away from the evangelical religiosity with which I couldn't relate. He mentions hearing the Christmas song "Mary, did you know?" a zillion times, while I'd never heard of that one. I was going to give this one four stars, with a note that Ray Porter's narration itself is five-stars, but in re-consideration the book itself is worth the top score. Highly recommended. A book I listened to with horrified fascination as the author described in great detail the Christmas customs of middle class Texans in 2006. - people spending thousands of dollars on small decorative houses so the A book I listened to with horrified fascination as the author described in great detail the Christmas customs of middle class Texans in 2006. Maybe if I didn't live in Frisco, I wouldn't rate this book so highly, but I was thoroughly entertained! We lived through and inside the covers of this book. It was fun to turn a page and have the author tell a story about someone we actually know. It was also entertaining to figure out who he was talking about when he changed the names "to protect the guilty." This book transported me to 2006 Frisco, Texas. Not a bad place to be. No, it really wasn't! God bless us, Every one! And God bless America. Christmas brings out the best in most people. Of course, there's a great variance in that "best", but I believe people try. This is a charming look at what people do to keep Christmas in their hearts and in their families. There is a great affection for these families and their hopes, dreams, and fears. A lovely read for the holiday season. The author took his time to concentrate on several families in Frisco, Texas. I like this approach since it makes me feels like I know more about a community and its residents. Hank Stuever took off 15 months as a culture writer for the Washington Post Style section to find people in “drought-prone Sunbelt states dreaming of white Christmases they know will probably never come” (11). He lands in Plano and Frisco, Texas, stalking four people: Tammie, who decorates houses for women who don’t have time to “figure out the mantel” (22); Caroll, who every year on Black Friday gets a free snowglobe at JC Penney; and Jeff and Bridgette, who stage a visible-from-space lightshow Hank Stuever took off 15 months as a culture writer for the Washington Post Style section to find people in “drought-prone Sunbelt states dreaming of white Christmases they know will probably never come” (11). He lands in Plano and Frisco, Texas, stalking four people: Tammie, who decorates houses for women who don’t have time to “figure out the mantel” (22); Caroll, who every year on Black Friday gets a free snowglobe at JC Penney; and Jeff and Bridgette, who stage a visible-from-space lightshow on their lawn. Throughout the book, Stuever mostly observes. “I cast myself merely as an extra,” he writes, “a Wise Man in a purple velour bathrobe and a cardboard Burger King crown” (5). Stuever spends two days in the library finding out about the dirt on which the stores were built. He shares the history of Christmas lights, Christmas trees, and nativities. He laments the changing tenor of letters to Santa, becoming “more terse and specific in their requests” after 1903. But his most interesting research is experiential, where he finds a strangely normal and abnormally strange world full of chain restaurants, box stores, boutiques, and Christmas bazaar’s with plaques for sale that say “On Dasher, on Dancer, on Master, on Visa” (39). He goes to church with Caroll and finds Reverend True Religion Jeans wearing an unconstructed blazer stenciled and embroidered with a combination of romantic vampire touches: griffins, royal crests, gothic crosses, and vine-like paisley swirls” (100). He doesn’t really like the sermon – “There are five ways. There are eight steps. There are four keys” – but then, tired of his own church sarcasm, he writes, “What the hell… I lift my arms. I hold my palms” (104). Stuever’s willingness to find redemption anywhere – from Costco to a Costco-sized church - saves his book and, it would seem, his life, from nihilism. Stuever spends a lot of time in the mall because the mall is a major character in American drama: “In zombie movies, the last surviving humans find refuge in the mall,” he writes. “In Christmas movies, the mall mayhem triggers the protagonist’s profound insight that none of it matters so much as love” (69). But he’s not cynical. Music may be “piped in from small speakers in every tree and planter… a Nora Jones and Maroon 5 fantasia,” but that homogeny isn’t something to disdain (57). “Chain stores,” he writes, “are not merely redundant: chains bind us together, make us familiar to one another no matter what state we live in, give us comfort as they take away a sense of the local” (68). He speaks in mall language, in mall comparisons. He describes someone’s inflection as “that same chipper tone as the girls at Banana Republic” (16), a time of year as “before the trees are lit in the home-and-garden department of Target” (19). What’s between the stores is equally important and worthy of description. He talks to the Israeli man selling fake snow at a kiosk who just “finished his compulsory service in the Israeli army,” stationed on the Gaza Strip (74). He spends an evening with the Spanish-speaking immigrants who do the Christmas decorations for the mall in one night. For Stuever, what it seems to come down to is mall-ography, “where you identify yourself more by your box-store preference than anything else… describing yourself… as part of an evolving autobiography of where you shop” (66). He specializes in the special language of capitalism. Stuever is a reporter and this non-fiction work chronicles his time spent in a suburb of Dallas Texas as the city and its families prepared for Christmas 2006. Porter’s reading of this work is quite good. He gets the cadence and rhythm of speech of his subjects, which brings a certain life to the work. This is Christmas before the economy took a tumble, before mass foreclosures and lay-offs. When consumerism was still king, and especially so in the wealthier made-for-commerce suburban “country” communities like the one that Stuever visited, studied and reported on. He leaves no stone unturned. He works side-by-side with Tammy, a woman whose seasonal business “Two Elves With a Twist” has her decorating the homes of women who are either too busy, or feel inadequately prepared or talented to achieve the glossy magazine-ready decors they hire Tammy to produce. In another effort he helps the non-profit organization that puts out the “Angel” trees in churches all over the county. He also spends time following Carol, a single mother of three (one of whom is a married adult no longer living at home), as well as Jeff and Bridget who have a light display that has achieved national fame. The book is fairly reported, but I think Stuever struggles with whether he feels his subjects have the right Christmas spirit, or are missing it entirely. There is a certain wistfulness to some sections, especially when something reminds Stuever of his own childhood Christmases. Not all the stories are happy ones. At the end Stuever returns to check in with his subjects a year or two later and reports on the differences – jobs lost, babies born, successful endeavors, and some not quite so successful. But this reader was left with a feeling of “is that all there is?” Still, I think it’s well written, and performed well by Porter. It gave me a lot to think about. I didn't get around to reading this book (courtesy of the local library) until after the holiday, and perhaps it's just as well; the hyper-consumerism of the subjects of the book combined with the author's snark might have made it harder to get into the spirit of season. The book comes off much better post-Christmas, IMHO. Serendipitously set during the holiday seasons of 2006-2008, Hank Stuever visits with three families of Frisco, Texas - an up-and-coming exurb of Dallas - to examine their hol I didn't get around to reading this book (courtesy of the local library) until after the holiday, and perhaps it's just as well; the hyper-consumerism of the subjects of the book combined with the author's snark might have made it harder to get into the spirit of season. The book comes off much better post-Christmas, IMHO. Serendipitously set during the holiday seasons of 2006-2008, Hank Stuever visits with three families of Frisco, Texas - an up-and-coming exurb of Dallas - to examine their holiday preparations from a semi-sociological viewpoint. Starting with Black Friday thru the first week of January, Stuever spends time with the Trykowski's whose extravagant exterior Christmas lights (and yes, in Texas it's "Christmas" not "holiday", bless your heart) have turned into a side-business for the husband; as has Tammie Purnell's penchant for interior Christmas decorating. He also spends time with single mother Carroll Cavasos who provides entry into the megachurch Christmas phenomenon. And while I mentioned snark earlier, Stuever at no time makes fun of the individuals he interacts with; his sharpened pen treats them almost more as victims of the larger Christmas/Giftsmas madness. As balance, he spends time with the volunteers at Frisco Family Services, helping organize and hand out the donations received as a part of their Angel Tree Drive, as well as picking out gifts for a few angels on his own. Stuever is quick to point out the foibles of his fellow man (and woman), but admits to his own flaws as well, regarding the expectations of the season, both past and present. Review of the audiobook from Audible. I thoroughly enjoyed this book, especially as it was a refreshing change from the usual current holiday glurge. The author seems to give an honest picture of the families he followed, treating them with respect, affection, and humor. No, I don't think those attitudes are mutually exclusive. I think he did a pretty good job of capturing, from an outsider's perspective, what we all want Christmas to be, how we try to go about making it happen, and how it can s Review of the audiobook from Audible. I thoroughly enjoyed this book, especially as it was a refreshing change from the usual current holiday glurge. The author seems to give an honest picture of the families he followed, treating them with respect, affection, and humor. No, I don't think those attitudes are mutually exclusive. I think he did a pretty good job of capturing, from an outsider's perspective, what we all want Christmas to be, how we try to go about making it happen, and how it can sometimes fall short of that dream. He completely nailed Stonebriar Mall, Frisco, a certain type of affluent North Texas demographic, and Canton. I laughed out loud at his description of Canton, remembering my own WTF-moment when I saw the scooter-people last time I was there. My only criticism is his seemingly hurried treatment of the last two years of the book. He really only covers a single Christmas - 2006 - and just checks in and gives us an update of the 2007 and 2008 Christmases. It's unfortunate, because he was in a unique position to thoroughly document how the changing economy impacted our attitudes between those years. I remember 2008 as the year we could no longer pretend that there wasn't something seriously wrong with the economy, and that Christmas as especially black. But I suppose it wasn't *that* kind of a book. My brother gave this book to me as a Christmas gift and I could not put it down. It was horrific and funny and mesmerizing. Stuever reveals a world of crazy Christmasphiles for whom the season is the reason for obsessive rituals, spending, and excess. But Stuever is not heavy handed. He captures the subtle hopes and motivations of people looking to these rituals for meaning in a world where Christmas is something you do up big. He is at the same time incredulous and sympathetic to the people who My brother gave this book to me as a Christmas gift and I could not put it down. It was horrific and funny and mesmerizing. Stuever reveals a world of crazy Christmasphiles for whom the season is the reason for obsessive rituals, spending, and excess. But Stuever is not heavy handed. He captures the subtle hopes and motivations of people looking to these rituals for meaning in a world where Christmas is something you do up big. He is at the same time incredulous and sympathetic to the people who take him in and share their compulsions with him. He is not afraid to look closely at the ugliness of human superficiality or to linger a moment on some religious hypocrisy that appears immune to the Christmas facade of charity and good will. This is how Christmas began, after all, way before the time of Christ (and for centuries after his death), when it was a pagan celebration of the winter solstice. People gathered and danced by fires. The harvests were in and everyone gorged. As a newspaper entertainment journalist, I have stood on red carpets. I have talked to Meryl Streep and Jude Law and Kate Winslet on Oscar night. At parties, I've made small talk with Beyoncé and Helen Mirren and Jake Gyllenhaal. I have thought of something t This is how Christmas began, after all, way before the time of Christ (and for centuries after his death), when it was a pagan celebration of the winter solstice. People gathered and danced by fires. The harvests were in and everyone gorged. As a newspaper entertainment journalist, I have stood on red carpets. I have talked to Meryl Streep and Jude Law and Kate Winslet on Oscar night. At parties, I've made small talk with Beyoncé and Helen Mirren and Jake Gyllenhaal. I have thought of something to say to Natalie Portman, Prince, Nicole Kidman, Halle Berry, and George Clooney. Now Santa seems to be peering into my soul, and I'm stricken, mute. facet of this affluent suburb, but he managed to keep it funny and non-critical. He even developed warm friendships with the people he studied. OMG nothing quite captures life in suburban Dallas quite like this book. Love it! Lived it! "The Christmas lifestyle as most Americans know and celebrate it is only about a century and a half old, a straight line from Charles Dickens to Martha Stewart." This book was hilarious. Spot on. Best read AFTER Christmas. Goodness! I didn't realize I'd had this for almost a year! I saved it for Christmas time on purpose, thinking it would be a good, festive holiday read. Once I pulled it out, mid-month, to put it in the Christmas reading pile, I realized it might be a little too pessimistic and might squelch my holiday spirit. So, I read a couple chapters and put it away for later. A couple days after Christmas, I decided to finish it up since it was still "in season". I spent the last afternoon of 2018 finishing Goodness! I didn't realize I'd had this for almost a year! I saved it for Christmas time on purpose, thinking it would be a good, festive holiday read. Once I pulled it out, mid-month, to put it in the Christmas reading pile, I realized it might be a little too pessimistic and might squelch my holiday spirit. So, I read a couple chapters and put it away for later. A couple days after Christmas, I decided to finish it up since it was still "in season". I spent the last afternoon of 2018 finishing it up and must say that I'm not feeling as down as I thought I might be. My favorite good part of this story was the experience the author had shopping for Angel Tree gifts. A lot of Christians think we're the only ones capable of generosity toward strangers. I've found that to be very untrue, and actually somewhat the opposite, more times than I'd like to think about. God made humans with compassionate hearts and many unbelievers still act in ways that very well represent the heart of God. Unfortunately, what he later finds out about how Angel Tree operates is really disappointing to both him and to me. I think the saddest parts I read about his personal experiences were the times when it was obvious he was searching for something "magical" in Christmas---searching for what it's "supposed" to be. What he's searching for will only be found in Christ, cliche as that sounds. I imagine he would both chuckle and cringe at that statement. The character of Tammie first made me laugh ("things not in nature..." Ha!) but later made me angry. The amount of presents she bought for her kids was disgusting. I can't even imagine---what a waste! I researched Jeff and Bridgette (ok, fine, I Facebook-stalked them) and wasn't surprised to find out they'd divorced. That's sad but she was so mean and ungrateful to Jeff. At one point she says he'd be pretty much nothing without her. Looks like she's pretty much wrong there as he's still putting on awesome light shows for the city of Frisco and looks to be happily remarried to someone kind-looking. Yay for him. A few other fun mentions were the Muskogee display, which my son just went to last week with his girlfriend's family, as well as the dancing light display featuring Mariah Carey's most famously annoying "All I Want For Christmas Is You". Our town has a display featuring that, as well. Since I am not normally a non-fiction fan, this is the first time I have read a book that takes a look at the modern day Dallas. I grew up in the heyday of the Dallas TV show of the 70s and the misconceptions of my hometown that grew from the show. However, it is interesting to see the 21st century Dallas through the eyes of a visitor. It is almost as if we have indeed morphed into the Ewing world. Perhaps because we are still a relatively “new” American city, we still have the land to do everyt Since I am not normally a non-fiction fan, this is the first time I have read a book that takes a look at the modern day Dallas. I grew up in the heyday of the Dallas TV show of the 70s and the misconceptions of my hometown that grew from the show. However, it is interesting to see the 21st century Dallas through the eyes of a visitor. It is almost as if we have indeed morphed into the Ewing world. Perhaps because we are still a relatively “new” American city, we still have the land to do everything B.I.G. and Tinsel’s look at three Christmas seasons in Frisco, Texas shows that Christmas is no exception. As I listened to the early chapters, it is somewhat heartbreaking to see how superficial American Christmas celebrations are – and there is enough truth in his observations that they cannot be ignored. It makes me even more uncomfortable at the realization of my own complicity. My personal budget can barely accommodate a Wal-Mart tree, but like Tammy the frantic holiday home decorator, I have pored over magazine and holiday catalogue layouts for years. Yet it is not the perfect look we are seeking, it is that fleeting moment of Christmas joy that we convince ourselves these well designed rooms will bring. Fifteen years ago, very few of us in the DFW metroplex even knew of the then small city, Frisco. In 1990 the population was only 6,000 but by 2009 had exponentially grown to 100,000. It was a startling to learn that much of their infrastructure and huge growth was a result of sales tax revenue from first Stonebriar Mall and now the acres of restaurants and strip shopping centers that surround the mall and the requisite McMansions. Sadly that really epitomizes the American economy. The book offers no profound insights but it was interesting. However, after awhile the book seems to run a bit out of steam. My bookclub had dinner in the Frisco Square during the Christmas season (2010) and we were each disappointed in the display. There was no blowing snow and display was interesting but to hear the music you had to turn your car radio to a certain station. However even with the music it did not seem to live up to our expectation. If you're looking for a feel-good Christmas book, this is not it. Stuever gives us a close look at what an exurban Christmas looked like in 2006, before things went bust. The setting is Frisco, TX, but except for references to A&M and mild weather, it really could have been just about any place in the country similarly afflicted with affluenza. He tells us how the season plays out, from the shopping and decorating crescendo that starts in the fall, through to the packing up of ornaments and If you're looking for a feel-good Christmas book, this is not it. Stuever gives us a close look at what an exurban Christmas looked like in 2006, before things went bust. The setting is Frisco, TX, but except for references to A&M and mild weather, it really could have been just about any place in the country similarly afflicted with affluenza. He tells us how the season plays out, from the shopping and decorating crescendo that starts in the fall, through to the packing up of ornaments and lights, exchanging of unwanted gifts, and dumping of all that holiday detritus in the landfill. While much of the book was predictable, there were some things that genuinely took me by surprise because I'd never paid attention (like the network of young Israelis specifically brought to the US to man mobile carts at the mall; the irony of an Israeli vendor in Texas peddling fake snow for Christmas is almost unbearable). The author also did a good job of reminding us that modern Christmas "traditions" are mostly relatively recent inventions. Stuever follows 3 families closely, and his characterization of them is often not flattering. When you put someone under a magnifying glass, you are of course going to see all the imperfections, but one of my criticisms of Stuever's writing style is that it can be pretty snarky. It's not necessarily the words he uses but sometimes just the juxtapositioning of ideas makes a mockery of his subjects. He is entitled to that, but at the same time, he does seem to like the families and considers them friends. So what you end up with is a conflicted tone that reminds me of a verbal tic some Southeners have: they append "bless his heart" to disparaging remarks, as in "he's such an idiot, bless his heart!" Hank Stuever goes to Frisco, Texas, a city that is continually growing as a city for the rich, to find out how some Americans in the 21st Century are celebrating Christmas. Most of the book happens in 2006 but Hank revisits Frisco in 2007 and 2008. But in 2006, the economy is still in a happier place and the citizens of Frisco are able to spend until their heart is content without many worries. Hank follows three sets of very different families- single mother Carroll, Tammie- a woman who puts up Hank Stuever goes to Frisco, Texas, a city that is continually growing as a city for the rich, to find out how some Americans in the 21st Century are celebrating Christmas. Most of the book happens in 2006 but Hank revisits Frisco in 2007 and 2008. But in 2006, the economy is still in a happier place and the citizens of Frisco are able to spend until their heart is content without many worries. Hank follows three sets of very different families- single mother Carroll, Tammie- a woman who puts up other people's Christmas decorations for a living, and Jeff and Bridgette-a couple who has one of the most famous houses in Frisco due to their Christmas lights. Each family that Hank follows, has their pros and cons. Caroll's daughter is portrayed as a clingy, almost bratty child. Tammie is portrayed a kind of a busy-body, and Jeff's wife Bridgette almost seems like she's always complaining at her husband. But these people have pros too-Caroll wants her family to be happy and I enjoyed her story the most. Tammie also wants to people to be happy and I think that's why she decorates houses. And Jeff and Bridgette use their light display to help collect food for the community. Would you be willing to let a stranger spend Christmas with your family? While he takes notes? Even when he asks how much you spent on everything? These are the questions Hank Stuever asks the reader in the acknowledgments of this book. As he hunkers down in the Texas 'burbs for the holidays, Hank tells the stories of three families as they prepare for their Christmases. All told, he'll spend Xmas '06, '07 and a bit of '08 with these people—a time frame that, for all the craziness that went down Would you be willing to let a stranger spend Christmas with your family? While he takes notes? Even when he asks how much you spent on everything? These are the questions Hank Stuever asks the reader in the acknowledgments of this book. As he hunkers down in the Texas 'burbs for the holidays, Hank tells the stories of three families as they prepare for their Christmases. All told, he'll spend Xmas '06, '07 and a bit of '08 with these people—a time frame that, for all the craziness that went down in the credit and retail sectors, makes the story presented here that much more interesting (and, as Hank points out, that much more inane). Because he does what he does so.damn.well, Hank's Tinsel perfectly captures the ridiculousness that is America (and all its malls and its excess and its parking lots and its Dave & Busters). And at no time is America more...well, AMERICA than in the month of December. Hank Stuever has written an amazing look at the American way of Christmas. In 2006, Stuever, a reporter, went to Frisco Texas, to find one of the nations most over the top celebrations. Before the recession, the upscale neighborhood, with its mega churches, mega malls, mc-mansions, and big hair, he follows three families as they each try to find that perfect "mega moment"(you know, when it all comes together and just for a few moments everyone is happy). From the crowds waiting in the dawn for Best Buy to open on Black Friday, to the suburban mom who decorates other peoples homes, to the family who decorates with hundreds of thousands of lights and computer generated programs, Stuever gets to know them and tries to explain why they do what they do. Following these folks around as they prepare for Christmas, they are mostly devout (some overly so), some giving more than they can afford,but seeing through different eyes the season of giving, he has created a fascinating look at the Holiday Season. I found this book both funny and sad. It is a close up of overindulgence and keeping up with the Joneses, as well as giving to the needy, and struggling to make ends meet. When he returned as the economy was starting to slide, it was interesting to see what if any changes these folks made. It made me long for a much simpler Christmas, with good friends, good food and NO GIFTS!! I can relate with a lot of the author's cynicism and found myself shaking my head at the opulance of the Christmases described. It was very difficult for me to relate to any of the families profiled in this book, but it was interesting to hear about. I didn't love or hate this book but it did keep me engaged.